Almost inevitably, muscles and joints become stiff and achy on a long flight, and that's no way to begin or end a trip. This discomfort is a question of flexibility, an aspect of fitness in which most Americans are found lacking, according to Dr. Christopher Cooper, associate professor of medicine and physiology at UCLA Medical School. "People who don't work on stretching and movement as part of their day-to-day fitness program will be more uncomfortable on planes," says Cooper. "And the problem gets worse as you age." Okay, okay. But your flight is tomorrow, so it's a little late for a fitness makeover. You can, however, avoid a stiff neck, a sore back, and thigh cramps by employing a simple solution: stretches. Not bouncing, muscle-tearing stretches, but slow, just-to-the-point-of-discomfort stretches that you hold for 10 to 30 seconds. Each one should be done at least six times. 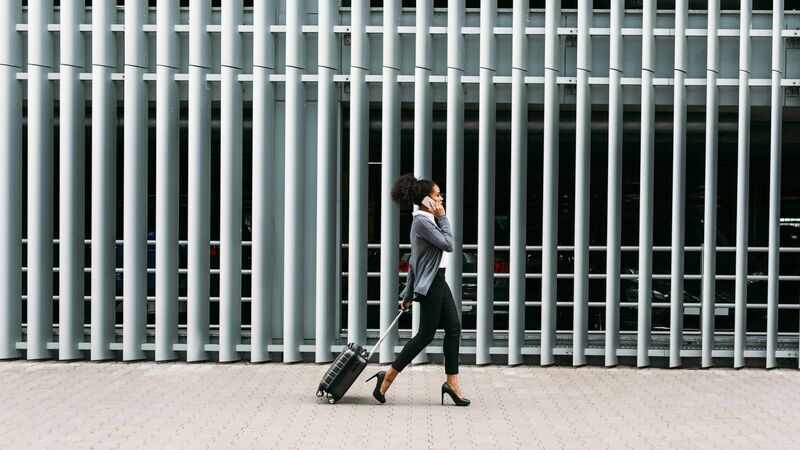 Start in the airport lounge before your flight leaves, then repeat the routine at three-hour intervals (more often if desired) during your trip. "These stretches are generally safe, but if you have a history of muscle or joint weakness or injury, consult your physician first," says Cooper. Lower-Back Stretch: If space and decorum permit, lie on your back and lean forward to touch your toes (or get as close to them as you can). For a slightly less effective stretch, you can touch your toes from a standing position. Hamstring Stretch: Standing three feet from a wall, put your palms flat against it at shoulder width. Keep your back and your left leg straight and lean forward, bending your elbows and your right knee so that the left hamstring, or rear thigh muscle, stretches. Repeat with your right leg straight and your left knee bent. Neck Rotation: Do these steps gently and slowly. Point your chin down to your chest, then up toward the ceiling. Put your right ear to your right shoulder, then the left ear to the left shoulder. Turn your head to the right so you're looking as far behind you as you can, and repeat to the left. Cooper advises against circular rotations of your head—they can easily damage vertebrae and disks. Shoulder Extension: Reach over your right shoulder with your right hand, stretching as far as you can. Repeat with your left hand. Then reach across your chest and under your left arm with your right hand. Repeat on the opposite side. Ankle Wiggle: No secret here. Just move each ankle every which way it goes, extending your toes and flexing in the process.